Incepted in 2010, we, "Elpie Engineers Pvt. Ltd."are a leading manufacturer, exporter, importer and service provider of high performance assortment of Sheet Extrusion Plant, Thermoforming Machine and PP Non Woven Line Machine. Located at Rajkot (Gujarat, India), we have constructed a state-of-the-art infrastructural base, which is segregated into various departments such as Procurement, Production, Quality Testing, Research & Development, Warehousing & Packaging, Transportation & Logistic, etc. All segregated departments are operated under the guidance of highly experienced professionals. The production department is equipped with ultra-modern machinery, tools and equipment in order to develop reliable products. Our offered thermoforming machine is used in making of disposable products like tea cups, Juice/water glasses, glass lid, plate, hinge lid containers, egg containers and meat/fruit tray. Due our easy payment modes, client-centric approach, competitive price structure and ethical business policies, we have been able to achieve indomitable position in the market. All offered products are designed and manufactured under the supervision of quality controllers by utilizing high grade components and innovative technology. We are exporting our products in Africa, Tanzania,, Kenya, Ethiopian, Somalia, Madagascar, Zimbabwe, South Africa, labia,Sudan and Togo. We provide repairing, maintenance and installation to our products. Being a manufacturer "Elpie" is our manufacturing brand name. The product range is developed in adherence to global quality standards. Under the leadership of our President, “Mr. Jaydeep Aghera”, we have achieved an outstanding position in the industry. His constant focus on quality has enabled us to gain huge client base all across the international market. The offered products are highly appreciated due to features such as robust construction, maximum output, high performance, hassle free operation, excellent functioning and longer service life. Also, client can avail the offered products from us in various technical specifications at affordable prices. Manufacturing, Trading, Importer and Exporter of Extrusion Processing Line and Thermoforming Machine. Elpie believes in Partnership, Reliability and Innovation and wants to be a world-wide leading company in Extrusion technology. That is why we continuously invest in research and development and why we train our employees in all aspects and details of the extrusion lines. Reliability is more than choosing the right steel for the tool. We want to be reliable in many aspects, such as service, communication, delivery and financial security. For us, Partnership means working together intensively and passionately with our customers and suppliers in order to achieve the highest level of product quality, output and cost reduction. We are certain choosing to Craftspeople leads you to success. 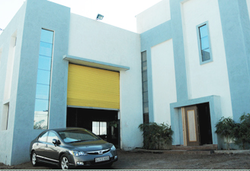 Elpie's state-of-the-art design and manufacturing facilities covered in 1000 sq. meter are located on the outskirts of Rajkot, Gujarat-one of the most industrious states of India. Facilities comprise design office and tool-room with state of the art computer aided and conventional machine tools. Autocad, Pro-Engineer And Uni-Graphics software tools are used for product engineering and 3D modeling. The 4-axis Imported Vertical Machining Center (VMC) is instrumental for production of various parts with interpolated holes in addition to manufacturing majority of other critical components. To ensure that the products consistently live up to the performance standards, Elpie uses Self-sufficient tool room comprising 4-axis vertical machining center, CNC Machining center, universal radial drill, surface grinding machine, fabrication shop and paint shop. Ensure the right quality and output All manufactured products are tested on shop floor. We check the product quality and dry-run of each and every moving components of the line. Our support for and optimal start-up After we have delivered your line, our process engineers will support you install the line on location, set-up your machine and make sure you get the proper product quality and output as soon as possible. Neutralize wear with maintenance Spunbond line delivery is not the end of our work. In the line documentation you can find details for preventive maintenance of requisite components. You can outsource the maintenance of worn & torn out parts to our company. We take care of all aspects In case of an emergency you can always count on the all-round, world-wide service of Elpie. For perfect process adjustment and optimization, our experts will troubleshoot the entire situation and support the complete process when necessary. Backed by highly experienced team of professionals, we have been able to provide highly efficient products to our clients. Professionals working with us are hired on the basis of experience, skills and knowledge in their concerned domain. Our team members comprise production managers, technocrats, quality auditors, R&D experts, warehousing & logistics personnel, etc. In order to keep our professionals aware with current market advancements, we organize crucial seminars, industrial tours and training sessions for them. 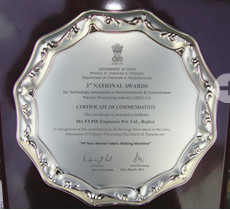 National Award For, India's first, one of it's kind PP Non Woven Fabric Making Machine by Government of India.